Hope you had all had a fantastic weekend! I'm back to the "grind" today, working 9am to 5pm all week at the office trying to make some $$ before I have to leave to study for the bar exam. 1) Fresh coffee in my pretty mug & Skinny Carmel Macchiato creamer. If you don't have your own special mug, I highly recommended picking yourself up one (I got mine @ Hallmark -- random, but they have adorable coffee cups! ), it really makes the experience a little more special! ;) Also, you've gotta pick up this line of creamers if you love a little flava in your morning cup of joe! 2) A big bag of fresh st-rawww-berries from Indiana. I swear they always taste better from there! We doggie-napped Scrappy from Justin's parents for the week! :) How can you not smile waking up to that pretty furry face?! I am determined to only buy lunch out once this week (I gotta treat myself to 1 fire roasted veggie salad -- probably on freaky Friday!). Today, I packed up some red pepper slices, a raspberry jam/mustard/cheese on a sandwich thin (a cray-zee good combo) and some of Justin's mom's vegetable soup, which I am SO excited to try! Jimmy, Buck, and Justin out in Chicago on Friday night! 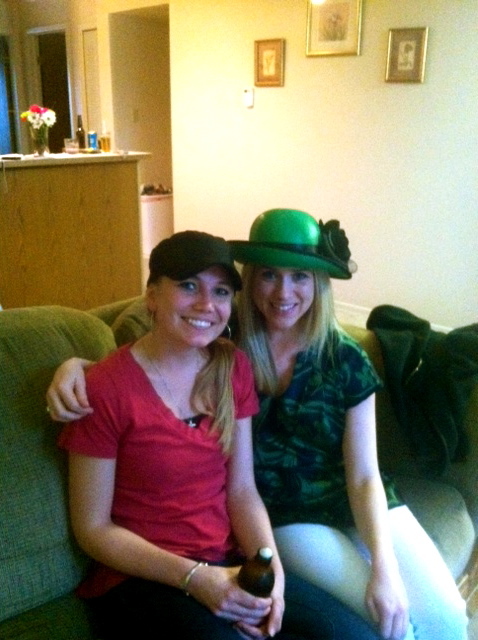 Me and my buddy Kristen @ the Derby party on Saturday. I hope you all get off to a great start to your week today! Get out there and make it a good one. Something to talk about: What's making you happy this Monday morning? !